I am an academic coach on four Title One campuses in our district. So, I travel from school to school helping our teachers provide effective and engaging instruction to our PK-5 math students. I am often traveling from class to class modeling lessons and would love the portability and flexibility this document camera has to offer. I could easily model lessons for students and teachers without interrupting the teachers' computers by logging in to their devices. I could keep this camera attached to my device wirelessly and have it available at a moment's notice. Modeling the math to our students is so important. The conceptual knowledge they are lacking is greatly impacted by seeing and doing the math rather than just the paper and pencil tasks we often see in math classes. 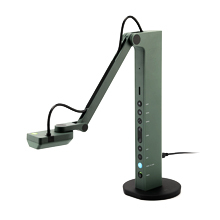 This document camera would allow me to demonstrate the concepts and allow the students to share their approaches with their classmates. I appreciate your consideration and think this website is helping so many teachers get the resources they wouldn't have otherwise. Thank you.